There isn’t a pill to improve lit­eracy. But a new program is offer­ing a prescription that’s getting families off to a great start. Read to Your Baby provides family physicians with the tools to start important conversations with parents about reading, including a free picture book (available in English and French), a fun “prescription” for daily reading and an invitation to get a library card for the child. It all takes place at the 18-month well baby visit. “We’re educating parents as the primary educators of their chil­dren,” says Evette Sauriol, early literacy specialist with Affiliated Services for Children and Youth. “We believe the gift of literacy supports children in reaching their full potential.” Research shows reading to preschoolers gives them the literacy skills necessary for early school success. Story-time also strengthens the parent-child bond. The program is working: an evaluation by the Best Start Early Years team showed that more than 80 percent of parents who weren’t reading to their child previously said being given the book has made a difference to their literacy activities. An HCF grant will allow Read to Your Baby to expand from 49 to 150 physicians—covering half of the babies born in the city each year—as well as support an aware­ness initiative to ensure long-term sustainability of the program. HCF also connected Read to Your Baby to First Book Canada, an organization that provides access to new books for children in need. Additional funding for book purchases has come from Telling Tales. 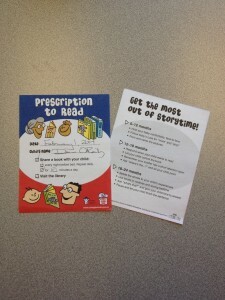 The prescription pads were developed by the Canadian Pae­diatric Society and printed by the Offord Centre for Child Studies.